Making wire wrap jewelry doesn't require a lot of tools, but some are essential to good results. Here's my list of must-have tools for a beginner or even an experienced jewelry maker working with wire. This is a first article in a series that I hope will help new wire jewelry makers get started on the right foot. And here's some great news! This article was updated on 7/23/2018! Note that this article includes affilate links to Amazon. If you purchase one of the items through these links, I will receive a small commission on your purchase. It will not affect the price that you pay. Also, none of the companies whose products are represented here have paid me in any manner to promote their items. The opinions on tools expressed here are my own, based on my personal experience, and I hope they help you! Before I start with a list of tools, there are a couple of other things to keep in mind when selecting tools. What size are the tools and do they fit your hand? Let's be honest - most tools were designed for man-hands, so if you have smaller hands, you'll want to try to find tools that will fit your hand more comfortably. This is especially true if you are older and have arthritis or any other joint issues. Luckily, it is not difficult to find affordable jewelry making tools that are ergonomically designed and appropriately sized. Do you need ergonomic handles? If you plan to work with wire a lot, you may want to look for tools with comfort grips or handles designed to make gripping easier. Now, on to the tool list! This is obvious. You can't make jewelry with wire if you don't have some way to cut the wire. But, there's more to it than that. Flush cutters are designed to trim the wire with a straight edge on one side instead of an angled edge. This will leave your cuts neat and prevent rough edges that can scrape skin or catch on clothes. Double flush cutters are more expensive, but will leave a straight 90 degree edge on both sides of the wire. Nice, but not critical, so buy according to your budget. The wire cutters you choose will depend on the thickness of wire you plan to work with. Many of the nippers or super flush cutters only work with thinner wires - 20 gauge and higher (i.e. thinner). If you use them with too thick a wire, you risk leaving a permanent dent in the cutting blade. I started with wire cutters that were part of a set of jewelry making tools just like these - and I still use many of these tools today. They are work horse tools, and having had them so long, I naturally reach for them. I don't think you need to start with a fancy set of tools, but your wire cutter is one tool that I would try to spend more on. Two flush cutters that I really like to use are from Xuron. The Xuron Maxi-Shear Flush Cutter cutters can cut up to 14g wire. The Xuron Micro-Shear Flush Cutter are for thinner wires, up to 20g. I like the pointy tips that make it easy to get close to a wire wrap and snip the ends close. These are definitely superior to the wire cutters you will find in a jewelry making kit. 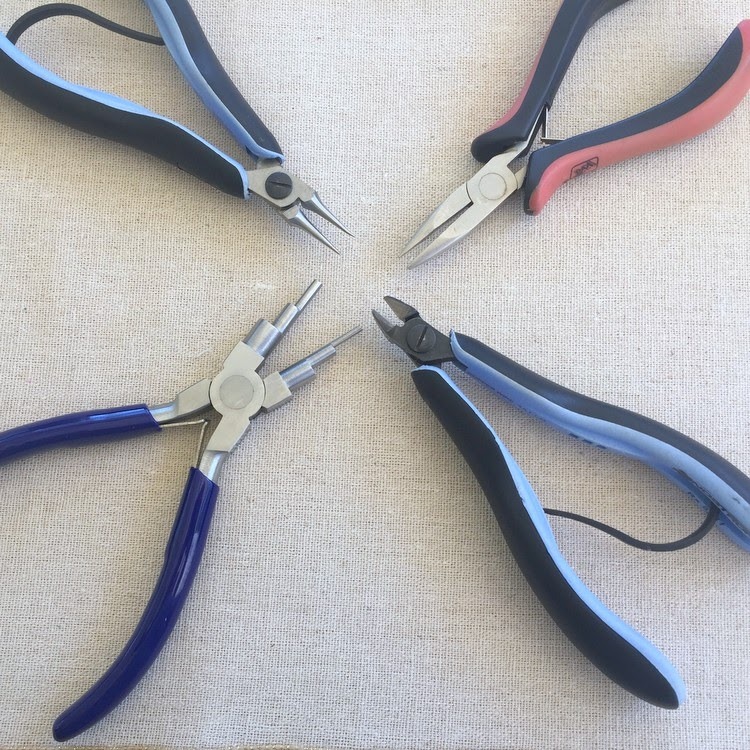 Round nose pliers are used to make loops, shape wire and tuck wire ends into tight places. Typical round nose pliers have two graduated barrels. Try to find pliers with barrels that are smooth, perfectly round and end in a fine point. I like ones that have a silver finish, so I can use sharpie to mark the spots I use most and have consistent sized loops. As I have gotten more advanced in my jewelry making, I have come to love six step pliers. Step pliers have sections of round nose in multiple sizes. They are great to make a consistent sized loop. 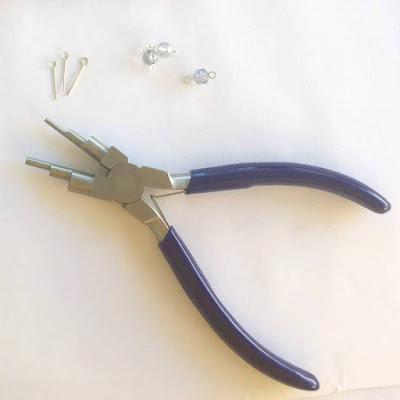 Originally, it was the three step pliers (in two different sizes) that I loved, but once I tried the ones with six steps, I realized they are even better because the smallest sized barrel is perfect for making open loops for rosary chain. If you have trouble making consistent sized loops, you may want to invest in these. Chain nose pliers are the work horse pliers. You will use them to grip wire in a variety of situations. I like ones that have smooth jaws - teeth will mar the wire when you grip it. The ones that come in the jewelry set are fine for quite a while and even though I have better pairs, I still use the ones I started off with today. Eventually, you will want a pair with thinner jaws like the ones pictured, the the heavier jawed ones are useful too, especially if you plan to work with heavier gauge wire (under 18g). Bent nose pliers are exactly what they sound like. Pliers with a bent end. Some people might not think these are a necessity, and I lived for many years just fine without them, but my jewelry making life changed dramatically for the better when I got a pair. These pliers help you grasp wire in tight places and at a different angle than you could ever do with the chain or round nose. They are more comfortable to use than chain nose pliers. They are perfect for tucking in the ends of wrapped loops. As my jewelry making skills have advanced, I use them less. But I think they are super helpful in the beginning to make it easier to get a different grasp and view of the wire. In many jewelry sets, there are additional pliers, but I don't think you need more than the ones that I listed to get started. What you really need, is a metal ruler to consistently measure your wire, beads, etc. I love, love, love, and could not live without a 12-Inch stainless steel cork backed ruler like the one pictured. It has inches and centimeter marks. The metal edge will not get distorted, the measurement marks are easy to read and they won't rub off. When I take my jewelry making on the road, I have a six inch version that I take with me. By now, I actually have several of these because my kids and husband find them handy too. 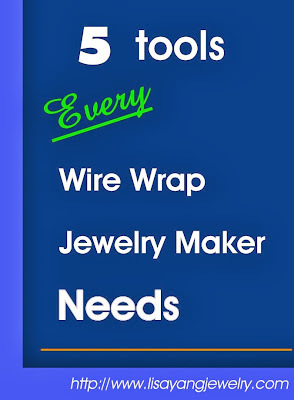 Remember, this list is what I consider the essentials for wire jewelry making. There are many other tools that will make your jewelry making faster and more consistent, but learning how to use the basic tools will make you appreciate the more specialized tools that are available. There are lots of brands and price points for jewelry making tools. I recently ordered some Wubbers specialty pliers - which I would consider mid-priced tools - and I will let you know if I think they are worth it. Top end tool brands are Swanstrom and Lindstrom - they cost a pretty penny, but I have heard they are worth it. I can only hope to be able to tell you that is true someday. I finally bought a pair, so check here for a side by side comparison with my old tools - Should you Buy the Best Jewelry Making Tools You can Afford? Wondering what tools you should invest in after you have the basics? Check out 4 Cool Tools for Wire Workers and Jewelry Makers. And last but not least, it's not just the tools, but what you are using the tools with. See this article on how to choose wire for jewelry making to avoid all of the mistakes (well, maybe just some of the mistakes) I made when I got started. That's right - you can get my blog updates delivered directly to your email, twitter account, etc. for free!! Not only that - all of my tutorials and jewelry making advice - well those are free too. Subscribe to Lisa Yang Jewelry by Email Make sure you confirm your request by replying to the email.